In Peru, archaeological treasures are weaved seamlessly among sweeping, unspoiled valleys and the mountain scenery of the Andes. Add into the mix a host of vibrant and friendly locals, and you’ll soon realise there’s much more to discover here than just llamas and knitted chullo. You’ll ride the wave of charming chaos in the coastal capital of Lima, before travelling to mountain-top Machu Picchu and gliding through the tranquil waters of Lake Titicaca, discovering history and legend along the way. Day One: Depart from your chosen airport with Titan’s VIP service to London Heathrow for your flight to Lima. We arrive in Lima and transfer to the Jose Antonio Hotel. The remainder of the day is spent at leisure. You may want to explore this vibrant city or just relax at the hotel. This morning we take a tour of the old ‘City of Kings’, the alternative name was in fact the city’s original name chosen by the founder of Lima, Spanish conquistador Francisco Pizarro. Founded in 1535, Lima is renowned for its colonial architecture, especially at the heart of the city. We begin our explorations in the Old Town, roaming the streets that have stood through earthquakes and truly fascinating historical times we pass the Government Palace and majestic, historic squares. We make stops at the cathedral and Larco Herrera Museum, where gold and silver from ancient Peru are displayed. The city’s walls are laced with incredible history of political, cultural and economic importance having played the role of capital of the Spanish dominions in South America until the 18th century. While here you can enjoy a relaxing walk amongst the remarkable architecture dotted throughout this enticing area. We transfer to Lima Airport this afternoon for our flight to Arequipa and travel to the Casa Andina Select Arequipa Hotel for our two-night stay. This morning we embark on a tour of Arequipa, a city used to earthquakes and renowned for enticing, scenic views due to three snow-capped towering volcanoes – Chachani, Misti and Pichu Pichu – guarding the city. The city’s architecture is utterly remarkable, having stood through nature’s traumatic outbursts – with one earthquake in 2001 causing extensive damage to the region – interestingly, the buildings magnificent structures are made from locally-sourced white volcanic sillar rock. The city was UNESCO-listed in 2000 for outstanding structures such as the beautiful, large cathedral residing here. During our time here we visit the fine old quarter of San Lazaro and the spectacular Monastery of Santa Catalina, Peru’s most important religious building spread over 20,000 square metres that served as a base for Dominican nuns during the 16th and 18th centuries and boasts a plaza, delightful gallery of paintings and sculptures and a chapel, the Monastery is still advocated by a religious group today. As one of Arequipa’s most famous churches, the Monastery of Santa Catalina also has numerous rooms to explore all of which reveal the unique and enthralling history of the church, during our guided tour. With the afternoon is at leisure, why not embark on an optional tour of your choice. Today we travel from Arequipa into the Colca Canyon marvelling at the colourful Andean Valley as we journey to Chivay – located in the southern Colca Canyon region, this charming town showcases a cultural main square, green valley, array of pretty villages and views of the surrounding terraced hillsides and snow-capped peaks – to spend a relaxing evening at the Casa Andina Colca hotel. At the Cruz del Condor, Andean Condors soar gracefully on thermals rising from the stunning canyon. The scale of the canyon and its surroundings is breathtaking, with the summit of the nearby Ampato volcano over 5km higher than the canyon’s lowest point. Later we travel to Puno and our hotel for two nights – the Sonesta Posada del Inca Puno. A full-day excursion to Lake Titicaca reveals an area of great beauty and legend. Thought to be the birthplace of the sun, Lake Titicaca is South America’s largest lake, the sparkling deep blue waters and array of breathtaking views are a pleasure to behold. Local attractions include Uros villages, whose inhabitants live on floating totora-reed islands, and Taquile Island, inhabited by Quechua-speaking natives, where we see a demonstration of traditional hand-weaving techniques which offers a truly unique, insightful experience of the remarkable lifestyle and culture of these Peruvian natives. Returning to Puno, we visit the Sillustani archaeological site with its chullpa burial towers, situated on the shores of Lake Umayo, the burial towers were constructed by the Colla people who imprinted detailed carvings into the tombs, the tallest constructed towers stands at 40 feet on one of the hills. Today we take the Titicaca Train to Cuzco, journeying through Peru’s most dramatic and captivating scenery, climbing past small villages and grassland plains. We spend three nights in Cuzco at the Xima Cusco Hotel. Please note: 2018 departures will travel by coach from Puno to Cuzco. Situated in the Peruvian Andes, Cuzco, known as the ‘Archaeological Capital of America’, was the once fabled capital of the Inca Empire. Our captivating city tour includes visiting the Plaza de Armas – the ancient plaza hosts beautiful architecture, delightful arrays of lush flora and historic monuments and permanently flies two flags, the Peruvian flag and the Tahuantinsuyo flag, to highlight the Inca Empire. We also visit Cuzco Cathedral; construction began in 1559 on the sacred Inca site but took a staggering 100 years to complete. Wander amongst the inspiring 14 pillars supporting the unmissable star-shaped ceilings, and admire the 17th century European decoration and lavish collection of famous paintings including Marcos Zapata’s impeccable ‘The Last Supper’. The Temple of the Sun – the semi-circular structure constructed over a strong rock is one of the most famous among the ruins – and the ruins of Sacsayhuaman, the massive Inca fortress perched high overlooking the city, are also on our list for exploring today. Building work here began in the 1440s and took nearly a century to complete. We travel to the Sacred Valley, stopping in the charming village of Pisac where Quechua people, who live in the beautiful surrounding highlands, sell their stock and purchase any supplies they require in its lively market – a shoppers delight. Roam the colourful market where you can choose from many handmade Peruvian souvenirs to take home including jewellery, ponchos, Andean instruments and ceramics. Head to Ollantaytambo, where ruins include a series of steps and niches carved out of the cliff and where, since the 13th century, this beautiful area has been a delightful place to leisurely wander through narrow, cobblestone streets and charming, stone buildings – making you feel as if you have stepped back in time. Stay for two nights at the Sonesta Posadas del Inca Yucay Hotel. Our full-day excursion takes us by train to the magnificent lost Inca city of Machu Picchu, Peru’s historic, archaeological masterpiece. For most visitors, the sheer scale of this complete city once buried in the jungle is simply unparalleled. 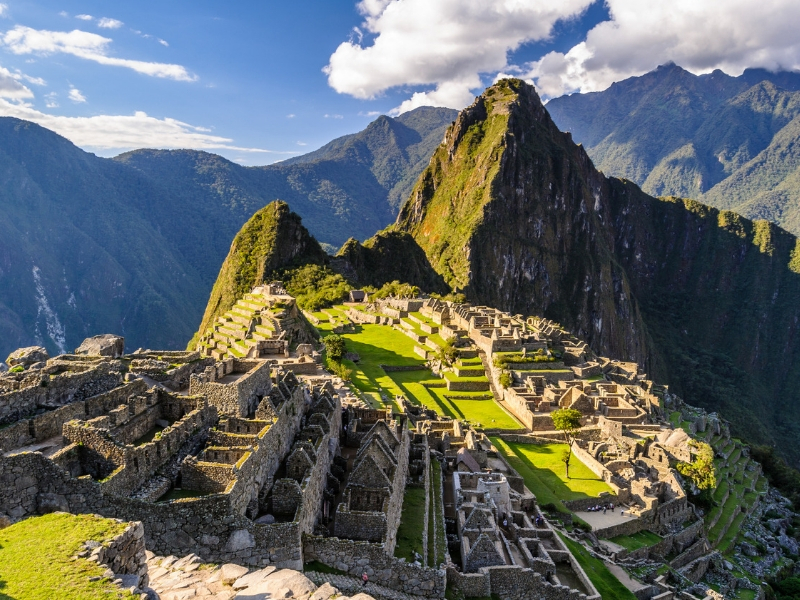 The complex is considered to have been constructed at the height of the Inca Empire between the 15th and 16th centuries, until it was abandoned at the end of the latter. Today we transfer to Cuzco Airport for our flight to Lima where we transfer to the Jose Antonio Hotel to stay overnight. Transfer to the airport for your overnight return flight to the UK.